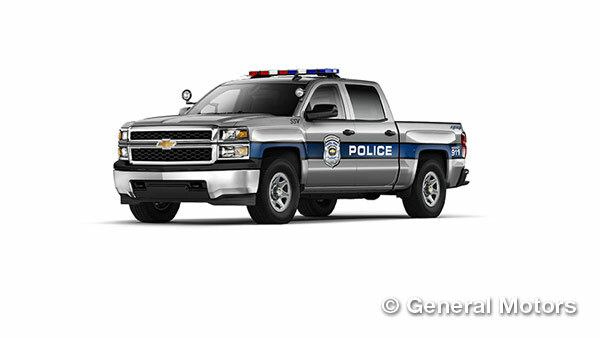 The Bowtie Brand recently announced its latest addition to Chevy’s police lineup: the 2015 Chevrolet Silverado 1500 Crew Cab Special Service Vehicle (SSV). 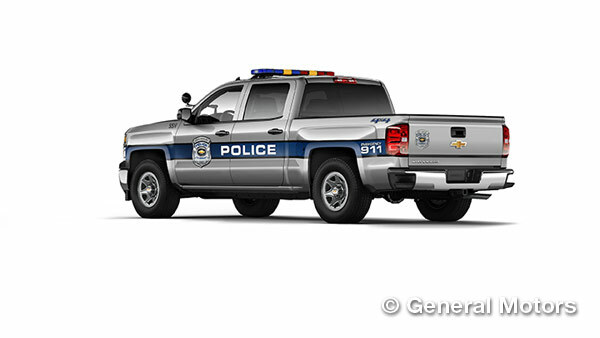 The Silverado SSV will launch this summer with the very same capabilities, efficiency, and durability as its sibling Silverado 1500, but fitted with extra goodies that you’ll need a police badge and a set of sirens to get. The Silverado SSV, available on the Crew Cab in 1WT or 1LS trims, is powered by the 355-horsepower 5.3-liter EcoTec V8, available with E85 capability. This baby gets 23 mpg on the highway, which is the greatest EPA-rated fuel economy for a two-wheel-drive V8 full-size pickup. Police departments can opt for either two- or four-wheel-drive models and can go with either the standard 6’6” pickup box or the 5’8” one. The Silverado SSV is powered by a 5.3-liter EcoTec V8 that puts out 355 hp. Special for the force only is the standard 170-amp high-output alternator and 730-CCA auxiliary battery that will allow officers to work from inside their cars even when they are turned off. With this technology, they can use lights to help write police reports, access radios and computers, and even utilize cameras, without the risk of running down the primary battery. The Silverado SSV also features a vinyl rear seat and large rear doors for transporting passengers (better known as criminals). Also available are an auxiliary dome lamp, an electronic four-wheel drive switch on the dash, and a front center seat delete for an open center console space for special equipment. Police can also make use of a 110-volt outlet for their equipment. The Silverado SSV comes standard with electrical power supply for four upfitter switches that are located on the center stack. A final innovative feature for the Silverado SSV is the common key, which would let officers use just one key for multiple Silverados (and Tahoe PPVs) in their fleet. Ship-through options will be available for aftermarket equipment, like light bars, partitions, and sirens.